I’m introducing a brand new feature to my ninja arsenal today, Esteemed Reader. I have made the commitment to myself that this year in addition to my usual reading, I am going to read one MG or YA novel a week. To keep me honest, I’ll be “live blogging” my reading list here. I’m not going to be reviewing the books so much as commenting on them. My new online policy is that if I don’t have anything nice to say, I’m not going to say anything at all. So, for example, if as was the case with a few MG books I read recently (not Artemis Fowl), the book is merely a rearrangement of Harry Potter and the Sorcerer’s Stone, I will simply comment here that the book had a familiar plot I could enjoy. I will be focusing only on the positive elements in each week’s book and leaving the negatives for you to discover in your own reading. Okay, enough intro already! Let’s get to it: This week’s book is Artemis Fowl, which I loved. 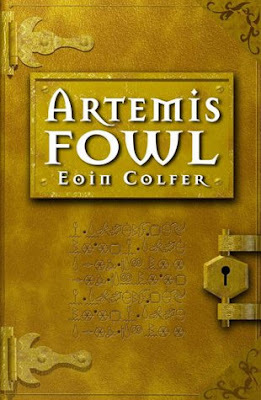 Artemis Fowl is a twelve-year-old genius criminal mastermind (awesome) who kidnaps a fairy and holds her hostage to extort fairy gold (more awesome) from the hidden kingdom of magical creatures. Eoin Colfer approaches this material in a way that is fresh, exciting, and not the least bit patronizing so that adults will be able to enjoy this book as much as their children. Artemis is a welcome change from the standard unlucky but scrappy hero (whose parents are probably dead) who means well and is genuinely courageous that populates most MG series. Artemis Fowl doesn’t mean well for anyone but himself and his mother. He is relentlessly cold in his assessment of people and situations and he even poisons a fairy (don’t worry, this is MG and the fairy comes out okay, but still…). Artemis doesn’t kill anyone, but murder is never an impossibility for him (in fact, he threatens nearly everyone he meets) and that keeps the character fresh and interesting. Also fun are Colfer’s amusing pairings of traditional magic with modern technology so that the fairies are part standard magical creature, part Men In Black. Various characters have guns, ninja skills, bombs, and the ability to eat through nearly anything. The whole affair reads like a big budget summer movie and that’s a compliment. I love summer movies and I loved Artemis Fowl. Of special note to writers: witness how Colfer easily navigates through multiple third person fixed perspectives. His narrative is never restricted to just one character, which is a break from the norm in MG fiction and admirable. Although Artemis Fowl is unquestionably the main character, he isn’t always the current protagonist in the text. Colfer more often writes from the perspective of various fairies and even a dwarf, each with their own goal and story to tell. And the novel is all the richer for it. Check back next Saturday (or Sunday if I have a brain fart) for the Middle Grade Ninja’s Book of the Week! I know this is an old entry, but I'm re-listening to the Nathanial Parker narrated audiobook of this right now, and I'm in love, as always! The way Colfer handles so many viewpoints just makes me want to put down my pen and sob--or keep working very, very hard to improve as a writer!